The explosion Friday at an iPad 2 Foxconn plant in Chengdu City, Western China, killed 3 people and injured 15 more. 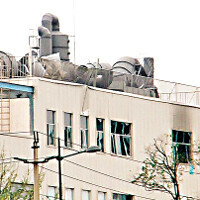 Initial investigation pinned the culprit to accumulation of highly-flammable dust in the polishing shop dust collector. We'd just add that the plant seems to have been built in around 70 days total, a breakneck pace for even Chinese manufacturing capacity standards. Local government has provided all sorts of incentives for the $2 billion factory, and now is arguably taken over from Foxconn to deal with the tragedy aftermath. There is a roadblock third of a mile around the factory, reporters' cameras are being confiscated, and the explosion doesn't make the news at the local newspapers. Investment bank Morgan Stanley issues a note this morning that while the plant is responsible for less than 30% of the iPad 2 total production capacity, the steady supply of Apple's second generation tablet might be affected, after all, pending the investigation at the factory's A5 building unit, where the explosion occurred. Apple already issued a statement expressing condolensces at the victims' families, and saying that the investigation what lead to the blast in its assemblyman Foxconn's plant, is in full swing. and this is the problem when idiots care more about their stupid electronics than human lives. A factory built in 70 days?? really??? and then they wonder when things go wrong. There was also a report that the factory workers were complaining of lack of ventillation which let the aluminum dust or build up in the air.. which caused the explosion when mixed with other air chemical pollutants. If they made anything I bought at that plant, I would stop buying their products. This makes over 20 deaths at the hands of apple/foxconn in what.. a year?? do ANY of you ibots care? feel responcible? ready to switch to a more responcible company? Secret meth lab. They put it in all apple tabs so people get addicted for no reason. Just a thought. People die and all you care about are your gadgets?!?!?! This just means that less babies will grow up without depth perception thanks to their parents who were told that iPads are better for learning 3D manipulation skills than wooden blocks.